Home » Historical » Georgian » Gems: Who Was This Amazing Mini-Suit Made For? You won’t believe this sweet little set from 1765 now on display in the V&A. No, it was not made for a child. While it is cut in the exact same way as an adult garment should be it is too small for an infant. Instead it is thought that this might well be a tailor’s sample taken to show prospective clients their skill. The size also cut down on the heavy cost of silk and buttons which were expensive in the period, especially as these enlarged buttons are made of silver thread. The complete lining is in woven cream silk taffeta while the coat and breeches are made of a matching pale green silk taffeta. The cuffs of the coat and the waistcoat fronts are made in a cream silk with – as if it could be made even more luxurious – silver thread woven in. In the 1760s this piece represented the most elaborate years of the Rococo popularized by Marie Antoinette, the very kind of frivolity that would lead ultimately to the French Revolution and her execution. 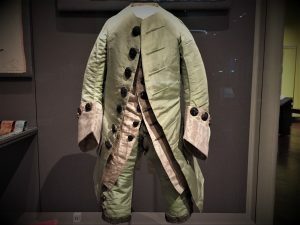 French coats in particular were more decorative and inspired by court coats worn in the presence of royalty while English styles of the period were more austere. This was the pelude to the “Macaroni” style archetype in England when such fashionable taste disrupted this stoicism. The precursor to Dandy, the Macaroni was one who went about in an elaborate manner full of decadence, eating, drinking and gambling. The actual term was derived from the Grand Tour of Europe when eating macaroni was seen as new and exotic. In this suit we see the final years of the court coat style before the wide lapels of the frock coat took over. While England led the way in tailoring and cut over cloth, France emphasised luxurious fabrics over all else.